Virtual machines (VMs) have been used for decades in mainframe computers to allow multiple copies of different operating systems to run concurrently on a single hardware platform. In the past, Intel® Architecture (IA) systems did not have all the processor and platform features that would allow the mainframe-style virtualization and ...software solutions that were developed in the 1990s. Intel has since introduced technologies to provide better performance in a virtualized environment. This document provides an overview of the Intel VMDq technology available in many Intel® PCIe* v2.0 (2.5GT/s or 5GT/s) Ethernet controllers and discusses how a Virtual Machine Monitor (VMM) (also called a Hypervisor) might utilize this technology to improve network performance in a virtualized environment. 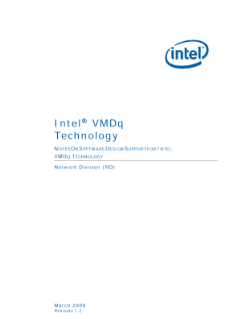 The document focuses on the 1st generation of Intel VMDq technology (VMDq1). It is designed to be a companion document to a specific product’s software developer’s guide; refer to Section 4 for a list of applicable Intel® Ethernet Controllers. Readers of this document should have an understanding of Ethernet, IP, TCP/IP, and VLAN. They should also have a basic understanding of operating system internals and application usage models for local area networks as well as a basic understanding of server virtualization. Read the full Virtual Machine Device Queues Technical White Paper. Explore how workload consolidation enabled by a virtualized Intel® architecture-based platform can transform your network. Umeå University's Johan Carlsson discusses efficiencies gained with the deployment of a private cloud.